Our new Credit Card Payment Calculator will help you calculate your minimum payment and estimate how long it will take you to pay off your credit card by making either minimum payments or fixed payments. See below for more information about how to calculate the minimum payment on your credit card. This calculator will help you realize just how much it really costs to pay the minimum on your credit card. There IS one case in which it might actually be beneficial to only pay the minimum. Read on below to find out when. Unlike our debt reduction calculator and credit card payoff calculator, this spreadsheet lets you see how long it will take to pay off your credit card if you make only the minimum payment month-after-month. This credit card minimum payment calculator is a simple Excel spreadsheet that calculates your minimum payment, total interest, and time to pay off. 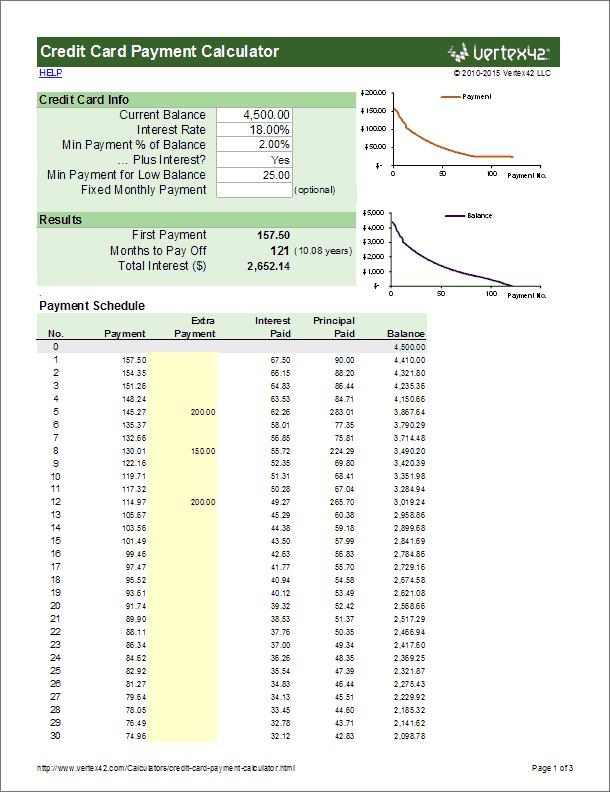 It also creates a payment schedule and graphs your payment and balance over time. You can now add extra payments into the Payment schedule to see how making occasional extra payments could help you pay off your credit card faster (see the screenshot). You can also choose to make Fixed Monthly Payments instead of paying the minimum payment. Update 10/16/2016 (.xlsx version only): I have added an optional 0% Introductory Period so that you can simulate paying off a card or doing a balance transfer to a card offering 0% interest for a number of months. How to Calculate the Minimum Credit Card Payment? The minimum payment on your credit card is usually either a percentage of the current balance (2% - 5%) or a minimum fixed dollar amount (like $15.00), whichever is greater. The minimum payment might also be defined as the interest plus a percentage of the current balance. Check the fine print on your credit card agreement to determine how your credit card company defines your minimum payment. If your interest rate was 18%, then the monthly interest rate would be approximately 18% / 12 = 1.5%. Credit cards are a type of revolving line of credit that don't have a specific amortization period defined. So, to ensure that each payment includes interest plus some portion of the principal, the minimum payment is defined as a percentage that is greater than the monthly interest rate. This percentage will usually be between 2% and 5%. Some credit cards may define the minimum payment as "X% of the balance plus interest" - especially cards where the interest rate is allowed to change. Defining the minimum payment like this ensures that the credit card payment will always cover interest plus X% of the principal balance. In the credit card payment calculator, enter the X% in the "Min Payment % of Balance" field and then check the "Plus Interest" box. When your balance gets low, the "Percent of Balance" calculations might result in a very small minimum payment, and in theory you'd never actually finish paying off the balance. So, there is almost always a minimum fixed dollar amount, usually about $15.00. 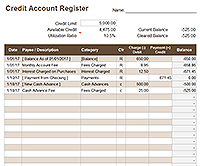 In the credit card calculator, you enter the $15.00 minimum value in "Min Payment for Low Balance" field. Some companies offer 0% interest for a number of months to entice you to sign up for their new card. After the 0% introductory period, the interest rate rises to the normal high rate. 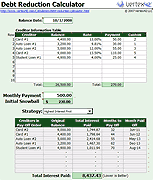 You can use the latest version of this spreadsheet to simulate that scenario, but be aware that missing a payment can cancel the introductory period. For credit cards, interest is usually accrued daily or based on the average daily balance, but most credit card calculators estimate the monthly interest by assuming that (1) the balance is constant and (2) the interest rate is the annual rate divided by 12. This is a pretty good estimate, but probably won't be exactly what you see on your monthly statement. The credit card payment calculator lets you enter a Fixed Monthly Payment amount. If you do, that amount will override what you have entered in the Min Payment fields. If the fixed payment is the same as or greater than the first minimum payment, you will generally pay off the credit card much sooner and pay much less interest overall. Why? If you are only making minimum payments, the minimum payment decreases as the balance decreases, so you aren't paying as much of the principal from month to month. Our credit card calculator can help you see just how much the difference might be. When Should I Pay only the Minimum Payment? There may be extenuating circumstances where you might want to only make a minimum payment (such as lack of money). There is also a case where it may be mathematically beneficial to pay the minimum. And that is ... if you are using the snowball method to pay off multiple credit cards. Using the snowball method, you can pay less overall interest and pay off debts faster if you pay off the credit card with the highest interest first and make only minimum payments on the other credit cards. This assumes that you are allocating a fixed total amount to paying off your debts so that everything left over after making the minimum payments on the other credit cards goes to paying off the one with the higher interest rate. Online Minimum Payment Calculator at Bankrate.com - This is a handy online minimum credit card payment calculator. Online Credit Card Payment Calculator at creditcards.com - This is another online calculator to help you calculate the true cost of paying the minimum. 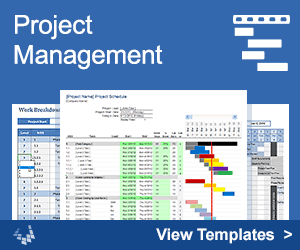 Disclaimer: This spreadsheet and the information on this page is for illustrative and educational purposes only. Results are only estimates. We do not guarantee the results or the applicability to your unique financial situation. You should seek the advice of qualified professionals regarding financial decisions.